Hand made file makers, founded about 1890 by Ben Brown. Brothers Fred and Wilf Davies joined him when they left school. They learned the trade of cutting files by hand. When Ben died he left the business to the two brothers who continued to run it into the 1970s, by which time they had installed some file cutting machinery. Fred retired in 1976 and died in 1989, and Wilf retired a short time later. Wilf then went on to give demonstrations of hand file cutting at the Willenhall Lock Museum, until he died on the 6th February 1993. 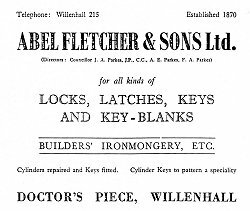 Note by Frank Sharman: Presumably this firm was included in the original gazetteer by Jim Evans because files were of such importance to the lock trade that a company which made (and probably re-cut) files could almost be seen as a part of the lock and key making industry. 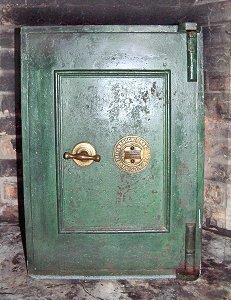 Nothing is known about Fisher & Company, who were lock manufacturers. Recently details of the sale by auction of their premises and the contents has come to light. The sale by Nock and Joseland was held in the Star and Garter Hotel, Victoria Street, Wolverhampton on 13th May, 1907. The following details are from the sale catalogue. The Premises are approached by a covered-paved gateway entrance from Grosvenor Street, suitable for, and used as a packing room. The shops, warehouses, and offices are excellently lighted, and gas is laid on throughout. There are mortice and press shops, with stands for twenty workmen, fitted with benching and stock holes, also a hearth on "Root's Blower," and 26 feet of overhead shafting with eight pulley wheels. A stamp shop with stands for six men, a hearth on "Root's Blower," benching, and 24 feet of overhead shafting with five pulleys. An engine room with 7½ hp. "Otto" gas Engine, 11 feet 6 inches of shafting with two pulleys and two water supply tanks. An oil store, a bobbing shop with stands for six men, benching, 40 feet of overhead shafting with twelve pulleys and cog wheels, a Mitchell's emery wheel, and a Keith and Blackham's ventilating fan. An office with a large Venetian window, tiled hearth and grate, cupboards and shelving, linoleum on the floor, blind and roller, lavatory, lobby, and waiting room with a seat and counter. A storeroom with cupboard, shelving, and linoleum on floor. A large warehouse with two large Venetian windows and roof lights, and fitted with four counters, cupboards, three sets of stock holes and shelving. A finishing shop with five windows and five roof lights, a stand for fifteen men, benching, a range of double shelving and 30 feet of double shafting. A making shop with five large roof lights in addition to other windows, benching, a stand for twelve men, and power shafting 2½ inches diameter. A casting store shop with stands for ten men fitted with benching and stock holes. A stovers' shop with stands for four men, benching and two large gas stoves fitted by the Wolverhampton Gas Company. Outside is a Coal House and a large open yard. The Property has a frontage of 44 feet 6 inches to Grosvenor Street. The auctioneers draw special attention to this very complete and compact manufactory, which is well situated within a minutes walk of the centre of Wolverhampton, and its three important railway stations. The purchaser will have the option of taking by valuation the loose plant, machinery, tools, etc., a schedule of which will be produced at the time of sale. Cartwright Lock and Pressings Ltd. was set up in 1974 by the Cartwright Group (manufacturers of door closures and door fittings), which was part of the Newman Tonks Organisation, of Straight Road, Short Heath. The new company was to manufacture two lever mortice locks under the Fleet Lock brand. They used the expertise of Rex Tuckley, who had for many years been a director of Gibbons and Co. (Willenhall) Ltd. and who had recently left that company. They built up a fine reputation with their range of competitively priced locks and latches. The business expanded and they moved into new premises at 377 Lichfield Road, Wednesfield. When the Cartwright Group took over Evered Security Products (formerly Erebus Ltd.), they formed a new company, Erebus Ltd. They moved the Erebus plant and most of its skilled staff into the Fleet lock works and ran them as one company. The managing director was Mr D. A. Richard, who had been MD at Evered Security Products. Another director was Mr G. R. (Rex) Tuckley, who had been works director at Cartwright Lock and Pressings Ltd. Together with two other directors from the Cartwright Group they made up the board. They discontinued the manufacture of the Erebus cheap range of locks, replacing them with the Fleet range (still sold as Fleet) but continued the Erebus higher range of locks, which Fleet did not make, and sold them under the Erebus brand name. Undated advert. From Trevor Dowson. Founded in 1870 by Able Fletcher of Ivy Cottage, Lichfield Road, New Invention. 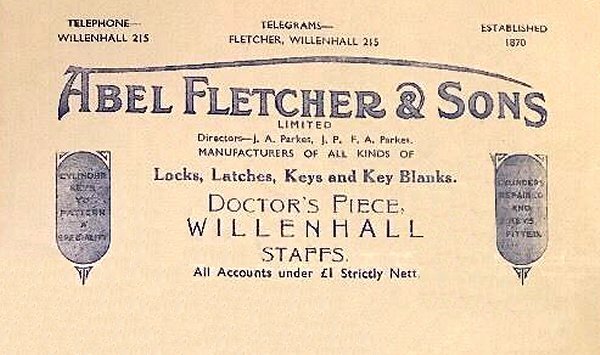 Taken over by his son William Fletcher JP (1864-1944). In Kelly’s 1900 listed at New Invention as cabinet lockmakers. 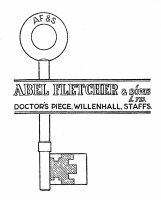 By 1948 Able Fletcher and Sons Ltd, 23 Doctors Piece, Willenhall were solely factors, selling all kinds of locks, keys, key blanks and builders' ironmongery. The Directors were Councillor J. A. Parkes J.P. C.C, A. E Parkes and Frank A. Parkes (son of J. A. Parkes). This illustration, provided by Trevor Dowson is from a 1971 trade catalogue. Bill head of 1940 (courtesy of Trevor Dowson) referring to "locks, latches, keys and key blanks of all kinds" but making special reference to cylinder locks. Frank Parkes ran the business from the time his father died in the 1960 until he sold it in 2000. A bill head from 1951. Cabinet lockmakers. They operated in premises next to the old Co-op. They were run by Ernest J Fletcher (possibly the son of Henry), with his sons Ernest (who was the organist at New Invention Methodist Church) and Grayson. Henry Fletcher also worked for him but was not a son. He later left to run his own coal delivery service at Bilbrook. Existing in 1936 and 1953. Not existing in 1970. Finished when the Lichfield Road was made a dual carriageway. No relation between this company and Henry Edward Fletcher (qv). Note: their address later became 238 Lichfield Road. These were the same premises but had been given a new street number. 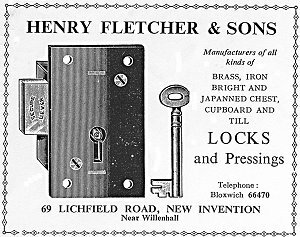 Henry Edward Fletcher, making cabinet locks, founded the business in about 1825, possibly as Fletcher Brothers in New Invention. In about 1885 he purchased a piece of land from the Pelsall Iron and Steel Company on which he built the present workshop. A new warehouse was built in 1911 and housed a gas engine to drive line shafts, which powered what machinery they had. The business passed through his brothers Henry Edward and Samuel, who came into the business c1906, before passing into the hands of Samuel's sons, Harold Edward and Mervyn Samuel. Harold started work in the business in 1934 when he left school at the age of 14. He used to sort out keys and castings, run errands and do a little filing. When Harold started work electricity had just been installed; until then a gas engine, which was very powerful, provided the power to drive the first power press. This was later replaced by an electric motor and subsequently by individual electric motors on each piece of machinery. Harold spent 6 years in the Royal Air Force from 1940, after which he worked for Chubb in Wolverhampton. Mervyn joined the business when he left school in 1950. Samuel and his brother, Henry Edward, retired in 1962 and Harold rejoined and, with Mervyn, took over the business. When there was a lot of work they would be joined by their wives to do some of the lighter work. At their peak they produced 500 gross  of locks in a year. 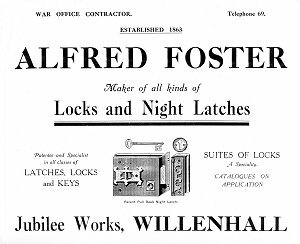 For many years their main customers were the lock factors, Willen Key Co Ltd [qv] and A Oakden and Sons Ltd of London. Due to the ill health of Mervyn, and Harold being well past retirement age, the brothers decided to close the business on the 31st March 2000. At that time they were still producing the same types of cabinet locks that were made by their grandfather175 years ago, although using more modern techniques with considerably less filling needed. They sold their tooling, order books and manufacturing rights to John Worrall. See Black Country Folk at Werk by Ned Williams. LMNL No 47. Key Maker. Existing in 1953, nothing else known. This advert appeared in 1920. It is not known if any of these were related. 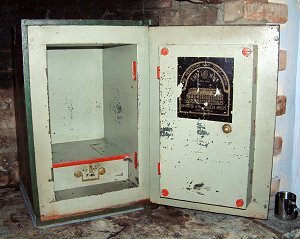 Tim Haines, the owner of this safe, says that it belonged to his great grandfather and probably dates from about 1900. The company name and trade mark appear on the label on the interior of the door. The maker's label from the inside of the safe door. It shows what seem to be extensive premises. The trade mark shown on the label. It shows a shield with the letters R and F interlaced and with the words & Co to each side. Whether the mantling was included in the mark is not known. At present nothing else is known about this company and all further information will be gratefully received. Tim Haines has also provided this photo of a key tag. Such tags were attached to keys in the hope that they would be returned (often enough for a reward) to a registry which would return them to the registered owner. This key registry tag came on the key ring holding the safe keys. It asks for found keys to be returned to the nearest police office and offers a 5 shillings reward. The registry is in Glasgow. ... and this is the other. It also asks for found keys to be returned to the nearest police office and offers a 5 shillings reward. The registry is the Star Key Registry of Newhampton Road, Wolverhampton. This tag would have been provided by Chubbs with locks and safes they supplied to a customer. 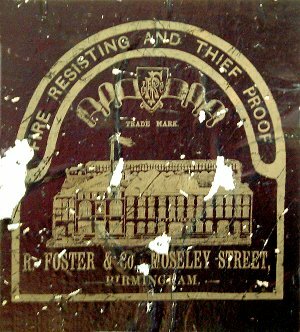 This tag calls for the key to be returned to the Chief Police Officer, Wolverhampton. It may have been attached to police keys.